Oh, what to do when you're Jewish on Christmas Eve and everyone else is at home drinking eggnog and singing Christmas carols? In Minneapolis, you meet up to eat Chinese food, listen to DJs, get drunk, and do karaoke. 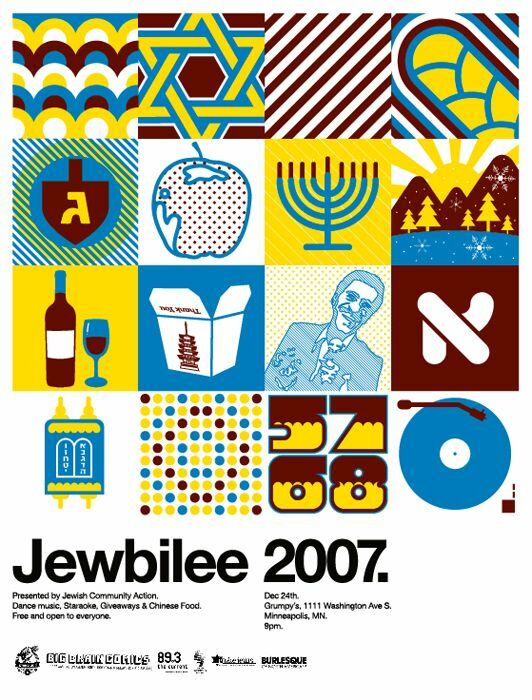 This Twin Cities phenomenon, known as Jewbilee, has opened its doors to non-Jews, making it essentially the best party each December 24th. Mike got to spin some music at this one and also designed the poster. It's a '60s-inspired grid of holiday imagery for all.